I suddenly had the urge to bake some bread, but wanted it to be something that'd provide us with lunch at the plot, whilst using lots of our home grown goodies. After a bit of a think this is what I came up with, nd rather good it turned out to be. No apologies for it being a bread mix, although of course purists can make it with strong flour and yeast with no trouble! And that's it! It doesn't really need buttering before you eat it as it is very moist, and keeps well wrapped in a cloth. 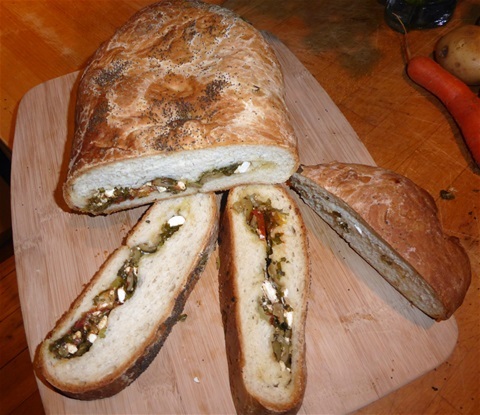 As long as you keep the proportion of filling to dough, you could use any herbs you like, replace the feta with cheddar, leave out the olives or add in more tomatoes, or any other variation you might enjoy. 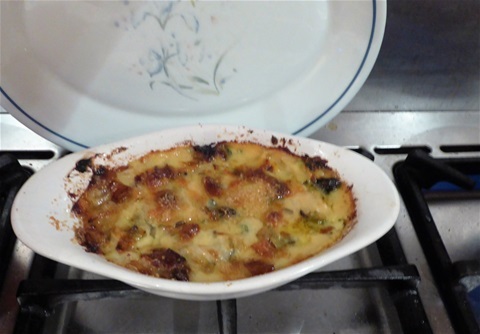 I quite like the idea of parsley and walnuts with parmesan, so that might be next! 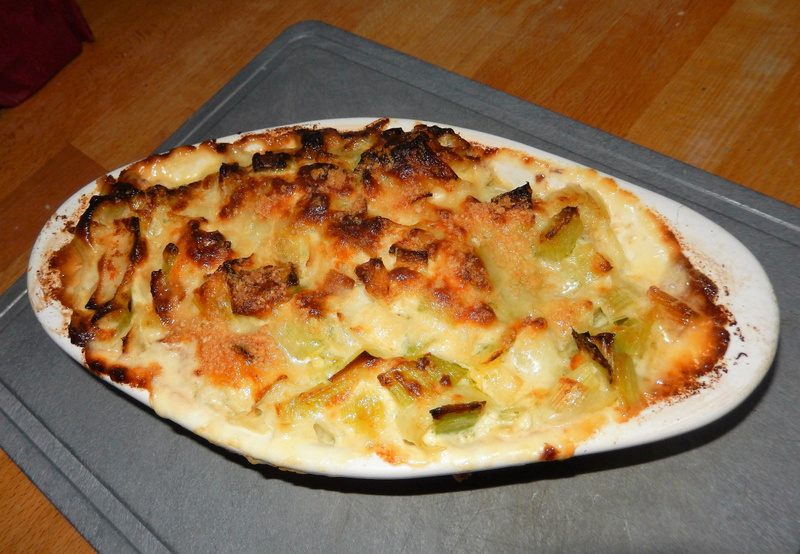 This might seem an odd time in the year to include a leek recipe, but we were given a mammoth one from someone who shows leeks and even when cut up was a huge quantity of leek! Our few little chard plants planted underneath the wigwam of climbing french beans had enough leaves to pick, and so here is what they ended up as.... and it freezes well too, which was very useful, given the amount there was! This is one of those recipes with slightly vague quantities, so you can make it with whatever you have to hand really. I have given here the amounts of each vegetable I used... and you may notice baby pattypans creeping in too! I have also made a version that included sliced red peppers, which was very tasty. - leeks: slice stems into 1cm pieces, sweat in the oil until almost transparent, but not browning. Drain well. 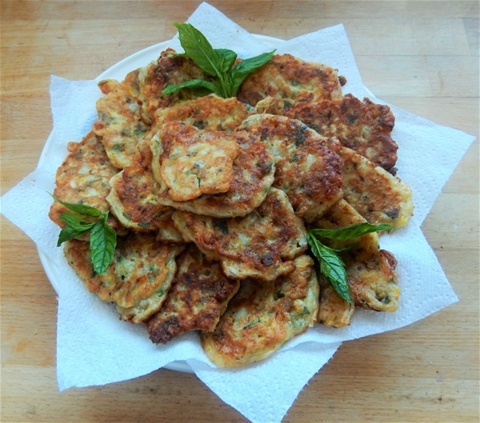 - patty pans: using same pan, fry gently until slightly browning on both sides. You may need a little more oil. - In a small non-stick pan, melt the butter, put in all the flour at once and stir to combine. 6. Put in the oven for 15 minutes until golden and bubbling. As I made this to accompany a roast dinner, it went in the oven towards the end of the time the potatoes were cooking. It is also good with sausage and chips, or scrummy on its own with some decent bread. Having had masses of large white pattypan squashes, more than enough really, I decided to try cutting them when they were really small and tender. They do remind me a bit of artichoke hearts like this, hence the idea of cooking them with garlic, lemon and olive oil, and I must say it was a great success. Several people have asked for the recipe, which is pretty basic to be honest, but here it is. 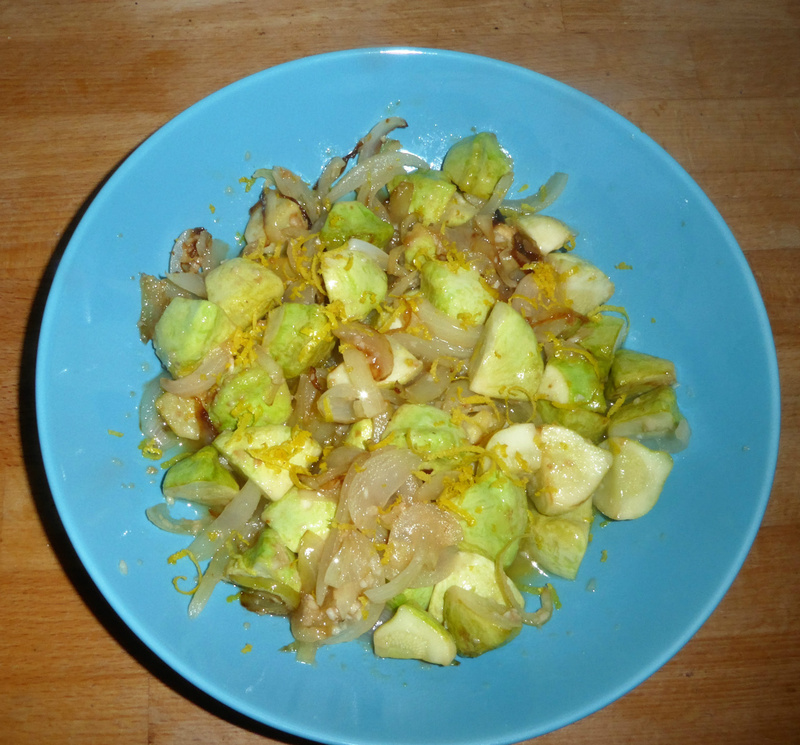 I guess you could also cook small courgettes or other squashes with soft skins in this way, or even larger ones cut into chunks, but the pattypans look pretty and turn a beautiful shade of pale lime green which does not really show up so well in the photograph. 2 cupsful of small squashes about 3cm across, or slightly larger ones in halves or quarters so that each piece is a similar size. I did say it was basic, but I hope it is helpful in using what could easily become another glut crop. Once this is cooked you can cool it and serve at room temperaure with crusty bread, or, as we had last night stirred into cooked pasta, with another glug of oil if needed. Chopped parsley or basil are good additions too, and you can substitute white wine for the lemon juice, although I would still stick with the lemon zest as it adds a real zing. This is the sweet dish I mentioned in this week's blog, based on a recipe from Akila Krithivasan who lives in India. She uses peeled pumpkin but I thought I would give it a go with courgette, and as courgette has such a thin skin, I left it on. The results were very good. 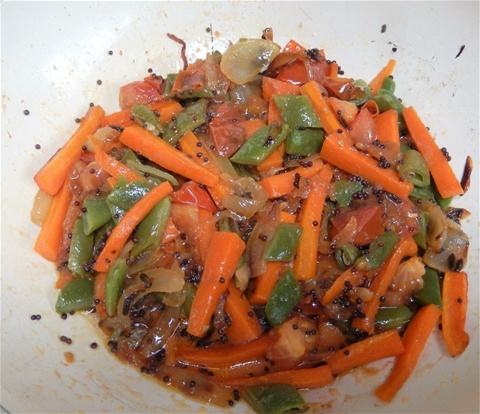 I also substituted butter and oil for the original ghee, as this is not always easy to come by. So, with thanks to Akila, here it is. Be warned, it is incredibly sweet, somewhat like a good fudge, but very more-ish!! 4. Stir in the milk powder and the rest of the butter. Keep stirring. 5. After about 6-7 minutes, the mixture will start to come together to make one large soft mass. Incorporate the nuts and turmeric or saffron, and put the hot mixture into a non-stick baking tray roughly seven by five inches. 6. With the back of a wet spoon, smooth the top. Be careful it will be very hot. 8. Chilling the halwa improves the flavour further. 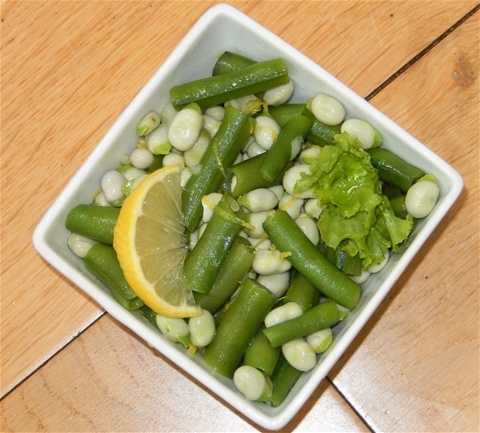 This is only seasonal in that it is a very easy dish to cook for friends to eat in the sunshine in your garden! 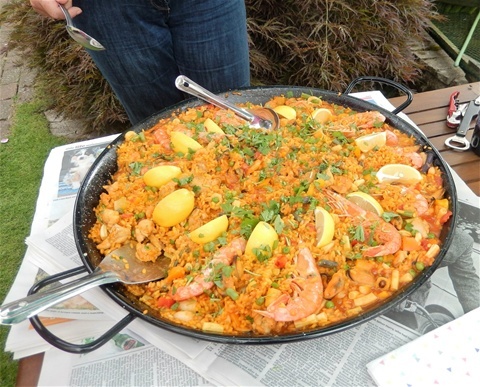 The quantity, which feeds around twelve hungry people, can be readily adjusted to cater for fewer, and if you have no paella pan a frying pan will do the job. Some people have allergies to sea food and this can be made just as successfully with chicken. 5. Add the seafood, beans, peas & tomatoes and cook for a further ten minutes, adding more hot stock if needed. If you are using the whole prawns, arrange them so they are partly submerged to cook right through. There should still be some sauce left, but not a lot, and the rice just tender. Organise the whole prawns neatly before garnishing the dish. 6. Put the sliced lemon around the edge and garnish with the parsley to serve. If you want to also add mussels in their shells, these should be put in at the same time as the whole prawns. Scrub them first to remove any grit, and discard any that are open, even slightly, before they are added, as these may well be dead. As soon as the live mussels are cooked, the shells will open and they are ready to serve on top of the rice. 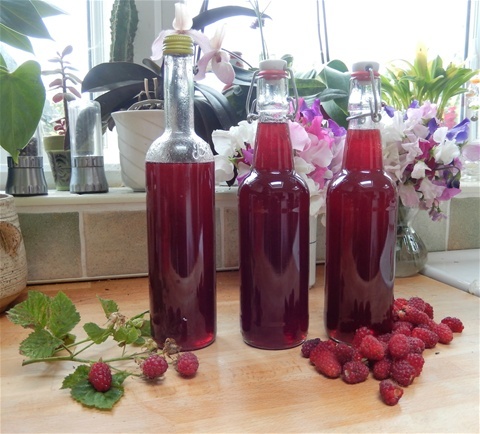 Loganberries are a very tart fruit that need quite a lot of sugar to make a palatable cordial... remember though that it is diluted with plenty of water or soda water when you drink it, so it is not quite so unhealthy as it might seem. You do have the added bonus of knowing there is nothing artificial added if you make it yourself. The fruits have a waxy coating to them, which separates when the mixture is brought to a rolling boil so that it can be removed. This cake has no discernable taste of courgettes, it is just beautfully moist and more-ish! 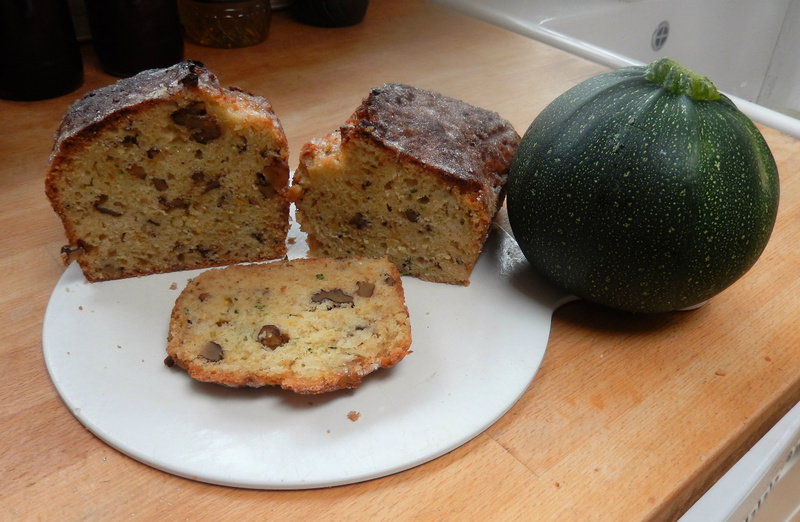 A friend asked me today if did actually have any courgette in it -- yes, two! One green and one yellow!! 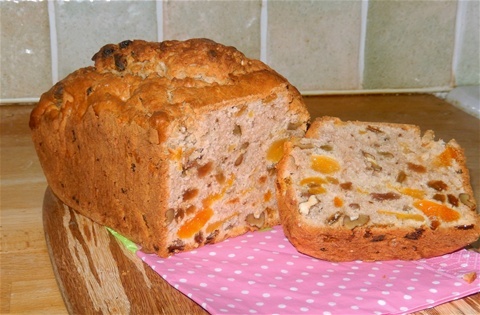 The quantities given make two loaf shaped cakes in tins 13 cm by 23 cm. It keeps very well wrapped in foil, and is so easy to make it is well worth making two at the same time... they will be eaten quite quickly to be honest! 6. Divide the mixture equally between the two tins and cook for 50-55 minutes. Check after 50 minutes to see if the cakes are cooked, by poking a skewer in to ensure there is no raw mixture left clinging to the skewer when it is pulled out again. 7. Leave to cool in the tins for 20 minutes, and then turn out before slowly spooning the topping mix onto the top of each cake. Allow it to soak in and cool for a further 20 minutes at least before slicing to serve. This week we had to unexpectedly harvest our broad beans to save them from being eaten by rats, and so we had lots of pods where the beans had not yet developed. Never eaten these before, so I was a bit tentative about this recipe. It turned out just fine and I can recommend it! You could of course make it with all beans if you have no pods, or include french beans instead. There are two schools of thought as to whether to skin the beans themselves or not, but to me much of the unique flavour of broad beans is in the skin, so unless they are massive beasts, I leave the skin on ...a matter of individual taste really. 2 large handfuls of young pods, trimmed and cut into 2 - 3 cm pieces and also blanched for 3 minutes. You can blanch both together. 1. 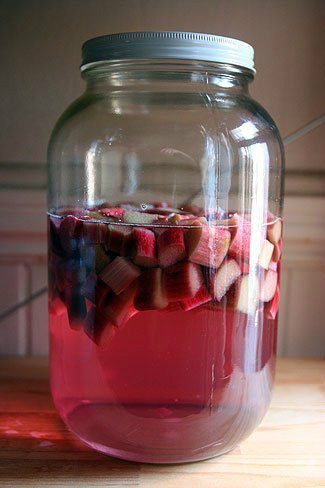 Using a food processor or blender, blend up the rhubarb until it is a pulp. It will look fibrous. You might need to do this in two batches. 9. 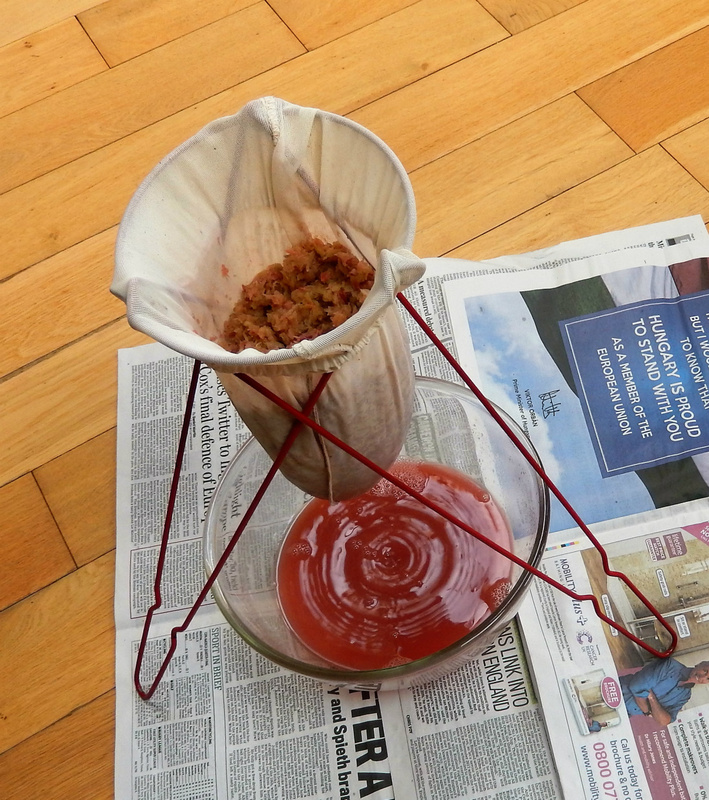 Using kitchen roll (one that does not disintegrate when wet) or a new J-cloth to line a funnel, strain the syrup into sterilised bottles and seal. Dilute to drink, either with water or tonic water for example. I am sure it would also make a good mixer with vodka or gin! 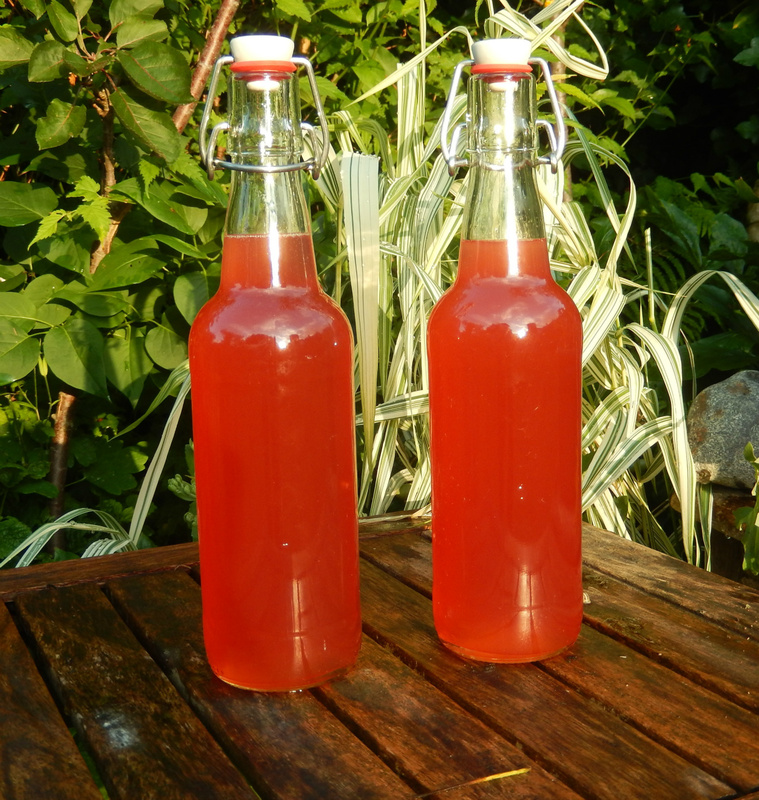 The cordial will keep in the fridge for about 3 months. The addition of some cashew or raw skinned peanuts makes this a more substantial dish. Add them with the carrots. 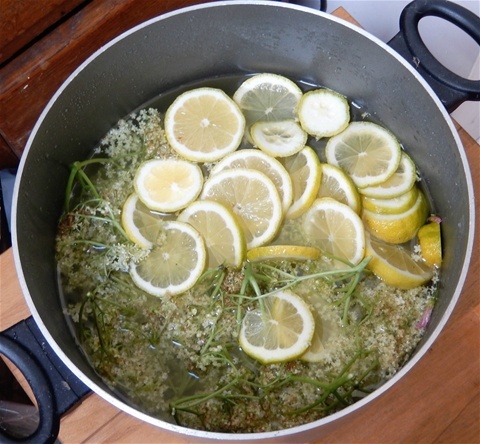 This just smells of Summer, and is so easy to make! Pick the flowers when they are dry, and the pollen is still visible, make sure you don't include any insects, and you can't go wrong! This is based on Mary Berry's recipe, and the inclusion of the Campden tablets (readily available on Ebay) means there is no possible fermentation, which is brilliant as the cordial will not fizz out when you open the bottles. 1. 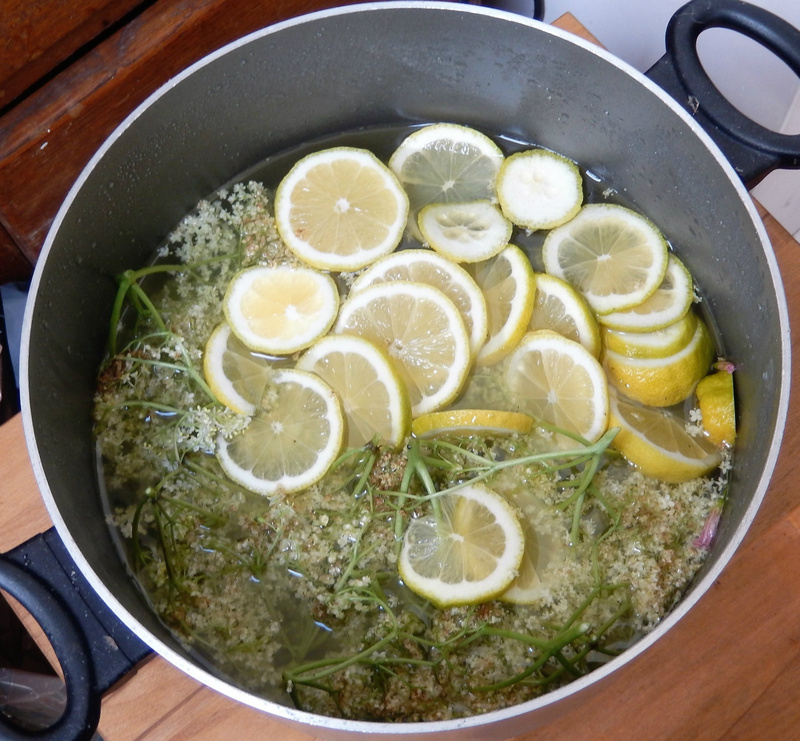 Put the water and sugar in a large non-stick pan and bring to the boil, stirring to dissolve the sugar. Leave to cool. 4. Sieve the mixture into a large sterile bowl, and then pour the syrup through sterlised muslin or a jelly bag back into the pan. 6. This keeps in the fridge for up to three months. To use: Dilute with water or fizzy water to drink. Mint or cucumber goes well too! 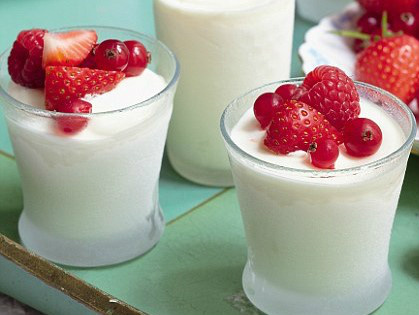 Once you have the cordial, this posset is a wonderful, simple way to use it, although you can use shop-bought cordial of any flavour instead. Fruit juice does not work though as it hasn't enough sugar. This is also based on Mary Berry's recipe.. if it ain't broke, don't try to fix it!! 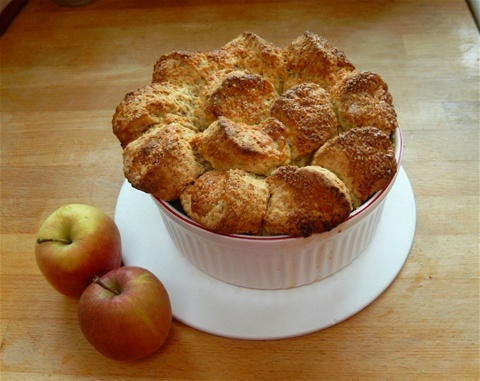 To serve: Allow to soften in the fridge for about 20 minutes, then decorate with Summer fruits and sift a smidgeon of icing sugar over the top. This is the simplest recipe, with gorgeously juicy, jammy results. Always good to feed a lot of people, especially on those chilly days that May still brings. 2. Put flour and salt in a large mixing bowl and rub in the butter until it is evenly incorporated and the mixtures is a bit like crumbs. Stir in sugar, and the coconut if using. 4. Put the crumble mixture on top of the rhubarb, and pat down. If there is a lot, you can pile it up a bit in the middle. 7. 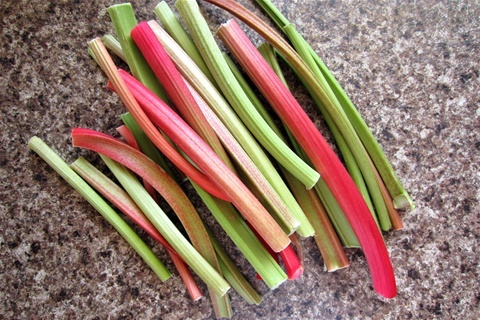 Put in oven and cook for 35-40 minutes, when the topping will be light gold and the rhubarb juices bubbling at the edges. 1. Put the vodka and sugar in a large scew top jar, add the vodka (plus any additional flavourings) and shake to dissolve the sugar. Don't worry if it does not all dissolve, as it will over the next few days. 2. Keep the jar in a cool, dark place the shake regularly. 3. The flavour intensifies the longer it is left, so after a month, taste to see if you want to bottle it or leave it longer. If you feel it needs to be sweeter, you can add a little more sugar.I usually leave it about 3-4 months. 6. Pour into clean bottles. It does not use to be kept in the fridge, and stores for at least a year. To serve: Neat in shot glasses, as the basis for a long drink with tonic water or soda water, with or without ice. 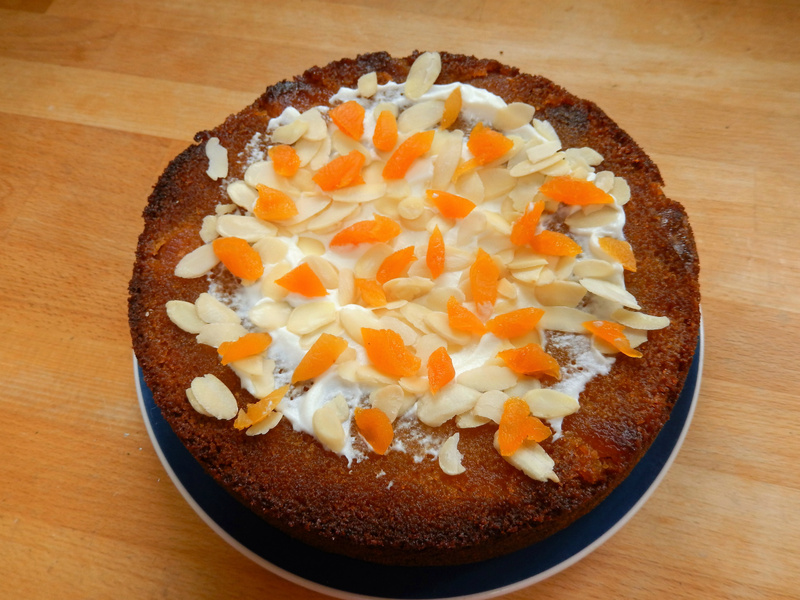 Luscious Apricot Almond cake, which sunk in the middle as it cooled! If you use gluten free baking powder, this cake is suitable for anyone who needs to avoid gluten. It is very moist and usually collapses in the middle as it cools, but filling it with creme fraiche in this way means it does not really matter. If yours stays in shape, then you can serve the creme fraiche on the side. I have also used the same recipe without adding the apricots, and sliced the cake in half when cold nd filled it with conserve of violets. It did need eating with a spoon! 8. Cook the cake for 45 minutes. If it is still wobbly give it a further five minutes. 9. Poke tiny holes in the top of the cake with a cocktail stick and carefully ladle the soaking liquid onto the cake a little at a time. 10. Leave the cake to cool completely before taking it out of the tin. I put it on the plate upside down yesterday, as the apricots had sunk to the bottom, and it looked better this way up. 11. If the middle has sunk, fill it with creme fraiche and decorate with some snipped apricots. We do grow a lot of leeks, and this is one of our favourite ways of using them to accompany roast dinner.This amount serves two generously or three who are not so hungry. 4. Allow to cool slightly before serving, as it will be very hot indeed. You can replace the parmesan with cheddar, or add grated nutmeg or thyme to the leek mixture before baking without any cheese. If the taste is too strong, or you are short of wild garlic leaves, you can use fresh parsley to partly replace the leaves. 4. Pour mix into the lined loaf tin and bake for 40-45 minutes. It is done when a sharp knife or skewer pushed into the middle comes out with no raw cake mix on it. There might be apricot smears on it but this is OK.
5. Leave in tin for 15 minutes before turning out onto a rack to cool, and peeling off the paper. Gorgeous slightly warm with butter, but keeps well in a cake tin if there is enough left. Made another one, using a cup of chopped, dried pears and a cup of coconut chips in place of the fruit and nuts, plus 2 tsp of powdered ginger ( 3 would have been even better I think) It did take longer to cook for some reason so covered the top with foil to stop it getting too brown. 1. Put the beans in a saucepan with plenty of plain water, bring to the boil and boil for 10 minutes. Take off the heat and leave them overnight in the water. 3. Brown the sausages and put in a large overproof casserole dish. 4. Slowly cook the onions in the same frying pan, adding more oil as required, until the are very soft and not quite caramelised: takes 10-15 minutes. 5. Drain and rinse the beans and add to the dish. 8. Put in the oven for 3 hours. If the sauce is too runny at this point, take off the foil and put the dish back into the oven for a further half hour. 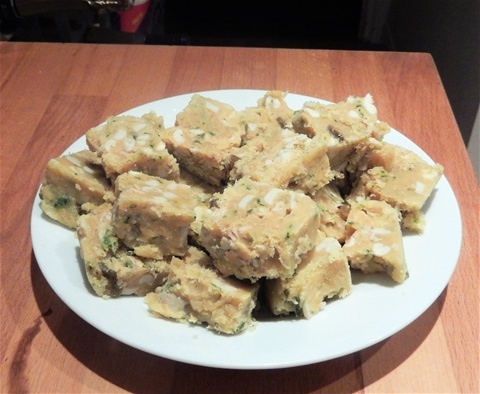 Serve with: plain rice, decent bread or just serve in a bowl to eat with a spoon. Turn on oven (Gas 200°C) and get out a 1.5l dish to cook it in, before you start. 1. Mix sliced fruit and sugar and pile in baking dish with the cloves. 3. Mix up egg and milk in a small jug, and add all except a teaspoonful to the dry mix. Bring together together ( I used a large knife) Add extra milk if needed. 4. Turn out onto a silicone baking sheet or a hard worktop and knead gently to a soft dough. Roll out 1.5 - 2 cm thick, using some extra flour for dusting. 5. Cut out enough scones to cover fruit, slightly overlapping - mine were 7cm across and I needed nine. Cut any remaining dough into scones to cooke separately. 6. Brush tops of scones with egg & milk. Sprinkle top of ones on the fruit with golden granulated sugar if you like this. We made this today, from what we had at the plot, and managed to use up all those tiddly fiddly carrots and parsnips that get left until last! Surprising how adept a six year old can be with a knife: after doing an excellent job in scrubbing them, she chopped them all up.... Mr Skinny Legs and Mrs Crazy Legs the parsnip twins were duly despatched to the pot. 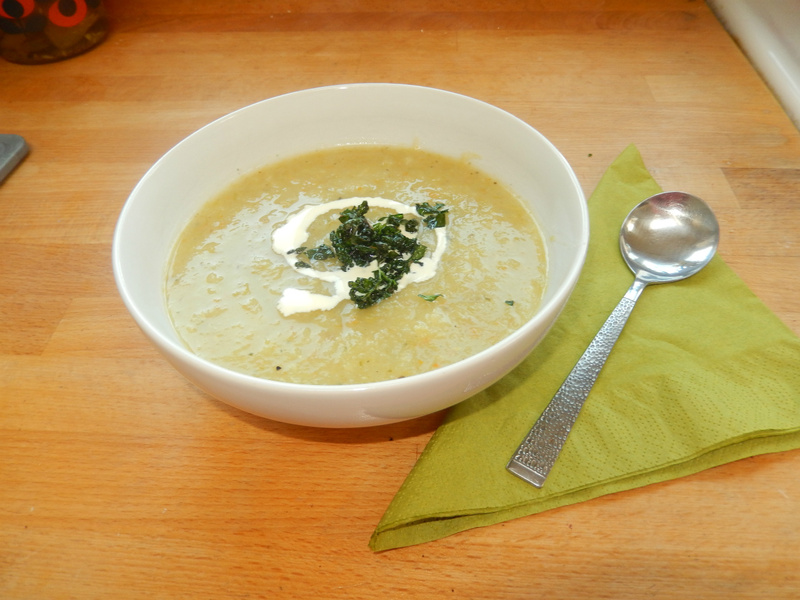 The kale garnish is delicious and really lifts the soup. Quantities are approximate and can be varied according to what you have: it will still taste good. pepper to taste, plus caraway seeds if you like these. 7. Ladle into bowls to serve, with a swirl of cream (1 tsp only) and kale as a garnish.